In this RadioMaster Reports article, we unravel the secrets of FM modes and explain how to know when to use NFM and FM. In an emergency, you may need to communicate with others who are using various types of radios, on many different channels. Are they using FRS, GMRS, HAM, MARINE, MURS, Business Band, PMR446, UHF CB, FreeNet, or KDR 444? Not familiar with all these acronyms? RadioMaster Reports explains what they are, who uses them, and what type of FM to use on each one. TL;DR: FM good. NFM not so good. The display frequency that shows on your radio is really just the center frequency or average frequency of the FM frequency channel. FM works by deviating that frequency when you talk into the microphone. Basically the width of the spectrum or bandwidth is what the transmit signal needs to modulate (wiggle or deviate) above and below the display frequency when you talk. Prior to the 1962, two-way radio systems used Frequency Modulation mainly on VHF and some UHF channels. We now call the older type of transmission mode WFM or Wideband FM, and it was a frequency deviation of +/- 15 kHz (plus and minus fifteen kilohertz, with a bandwidth of about 36 kHz at channel spacing 50 KHz). But, it was just called plain old “FM” before 1962. The old wide FM equipment (mostly vacuum tube gear) was somewhat less refined compared to today’s high technology communication systems. Back in those days, it was expensive to manufacture a radio with FM deviation of +/- 5 kHz (plus and minus five kilohertz). Frequency stability was also fairly sloppy in the old radio sets. But, the plain old WFM mode worked fine with unstable radios when the frequency drifted around. We still see some of the older military surplus radios in use with WFM, such as the PRC-77. The old wide bandwidth WFM required the channels to be separated by at least 50 kHz, because the transmitters on those channels would interfere with each other and slop over to the adjacent channels if the channel frequencies were spaced any closer together. Radios using FM – NFM – WFM. Wideband Narrowband FM Radio Communications. As technology moved forward with transistors, electronics became less expensive. So, the number of users of two-way radio systems increased. The demand for more radios required more channels to handle it. In 1962, the problem was (and still is) that there was only so much radio spectrum of two-way radio VHF-UHF bands available. It is a limited resource, there are only so many megahertz to go around! To solve this problem, brilliant engineers developed economical equipment that could work with a narrower FM deviation, +/- 5 kHz, and this could double or triple the capacity of the same finite megahertz of radio spectrum (bandwidth approximately 16 kHz with channel spacing 25 kHz). Channel frequencies could be more closely spaced together. But, this required new radios. In the 1970s, this was called narrow FM. Today we just call it normal FM, plain old FM, or regular FM. This mode of FM required better radios, and the quality of those radios also had the added advantage of better signals and going further than the older WFM equipment. This type of normal FM works the best because the 5 KHz deviation has a modulation index of 1.7. This high modulation index improves the Signal-to-Noise (SNR) for voice signals. (Modulation Index = Deviation divided by Modulation Frequency.) That’s one of the reasons that ham radio still uses it. Ham radio operators still use normal FM mainly because they were not required by government regulators to change to narrowband, and regular FM continues to work well for them. MURS radios can still use regular FM only on MURS channel 4 and MURS channel 5. GMRS can use normal FM, but most of the so-called GMRS bubble pack radios are now using NFM. But, don’t let your eyes glaze over yet, because the real point of this article is coming up. Note: the above table applies mainly to public safety radio and business radio. Ham radio continues to use regular FM +/-5 kHz deviation. Good examples of Narrow NFM are FRS radios, PMR radios, or a modern business-band UHF radios. Narrowband NFM only has a modulation index of .8 which is about half the modulation index of normal FM. You can fit twice as many channels per megahertz (approximate bandwidth 11 kHz with channel spacing 12.5 kHz). NFM may have better spectrum efficiency than FM, but NFM just doesn’t go as far. The 6 decibels reduction in NFM deviation and modulation index is sadly a 6 dB decrease in signal-to-noise ratio (SNR), and this unfortunately means that NFM causes a loss of about 30% of your distance coverage versus regular FM. Of course Narrowband FM works fine when you are nearby, when you have strong signals (full quieting), but when you get in the fringe zone at far distances, Narrowband NFM goes to static quite rapidly. You would need to double or triple your NFM transmitter Watts of power to equal a regular FM transmitter. That means that those who are interested in emergency, disaster, or SHTF simplex radio communications should stick with regular FM instead of NFM whenever possible. Switching from NFM to FM will boost your range by 30%. This recent change to NFM will probably be the last of the FM series. In the future, modulation will be all digital. With digital, the spacing between channels can be even more narrow, and the distance performance can be improved. This entry was posted in MURS, narrowband, radio programming, Survivalist Prepper Communications, UHF, VHF and tagged analog, Baofeng, Channels, comms, communications, FM, FRS, GMRS, ham radio, MURS, narrowband, narrowbanding, nfm, PMR 446, wbfm. Bookmark the permalink. To keep things in perspective, the FM frequency deviation (x2) is for all practical purposes the “approximate bandwidth” of the majority of transmitted power. That is easy to see on a spectrum analyzer. Carson’s Rule applies mainly to technical engineering issues about the bandwidth of the FM sidebands (down to about 2% of the power). So, Carson’s Rule may be useful for channel spacing standards (estimating adjacent channel interference), but it does nothing for optimizing FM receiver bandpass filter bandwidth or demodulator (discriminator) design. It doesn’t affect or predict distance range of FM over NFM. I have a Baofeng UV-5RV2+ Radio that I use going to work for the forest service. I am a smoke/lookout My problem is, after I manually enter a frequency in and save it. I also put in the repeater Freq. in, but I was told by our Tech. to not put the repeater Freq in the Receiver only in the transmit. So I go to take it out of the CTCS-R side and it will not do so. As soon as I push another button it comes back on all my channels. What am I doing wrong? Once you put a frequency into the UV-5R it goes in as a Simplex frequency, you then can add a Transmit frequency to make that channel/memory a repeater pair. To change anything to that memory location it must be deleted (Menu 28) totally and reentered with the correct data. Since Freeband FM CB was mentioned, I think it would be nice to mention that European CB radios have maximum legal deviation of 2 kHz and in practice are often between 1.5 kHz and 1.8 kHz. This, I think is interesting because I’ve seen European CB radios being sold with FM disabled, but enablable, as US CB radios and also EU CB radios being sold as 10 m Amateur radios in US webshops. This site seems to be pushing BaoFengs. Keep in mind that although you can receive in both VHF/UHF you are not compatible with other FCC complaint radios transmitting on that depending on model. The 5’s have a bandwith of 5kHz(WB) and 2.5kHz(NB). Whereas, the 82’s have 25kHz(WB)/12.5kHz(NB). The 5’s are for UHF transmit and the 82’s are for VHF transmit. Not to say you can’t use 5’s to talk to each other on MURS (or any frequency for that matter) but if you try to talk to a MURS compatible radio or VHF Marine or VHF Business/Gov’t radios, there will be issues. The bandwidth is all about compatibility and interference. The 5’s just are weak on VHF compared to the allowed spectrum of those frequencies. The receive will pass enough of the signal that you can understand but your audio will be weak for the guy receiving on let’s say a certified VHF Marine Band or MURS radio. What’s worse is using an 82 to transmit on the UHF freqs, ie: FRS/GMRS. Any other radio set to the appropriate bandwidth will receive you all garbled. Most importantly, you are causing severe interference and transmitting well outside the FCC regulated channel spacing requirements. Something that if the FCC ever starts policing the FRS/GRMS bands it will definitely draw attention to yourself. Just some info for people who buy these radios without knowing why they are not FCC compliant or fully understand RF Principles. The FCC doesn’t like knowing that novice people are able to transmit with the wrong bandwidth’s. But more importantly, if you want compatibility and comms in SHTF with other radios that aren’t BaoFengs know and understand bandwidth. They’re cheap enough to get both the UV-5r’s and UV-82. Just remember that although you can doesn’t mean you should. I’m just starting out and I’m confused by your statement about the 5’s bandwidth. From the specs published by BaoFeng, the 5R has selectable bandwidth of 12.5kHz (NB) or 25kHz (WB). Further, my understanding is that FRS is narrowband, but GMRS and Amateur frequencies are wideband. Finally, technically BaoFeng doesn’t make a part 95 compliant radio (IIRC), so you can’t legally use either on FRS/GMRS frequencies. Yes, I know that a lot of folks here are freebanders, so maybe that’s not a big deal. The above article is mainly intended to show that FM has superior distance range than NFM. The article provides standard information that can be utilized for any type of radio. RadioMaster Reports doesn’t push Baofengs. Baofengs are often utilized as examples, because they are ubiquitous and popular. It seems easy to confuse “channel spacing” with “deviation” or “bandwidth” or “maximum bandwidth”. Some radios specify deviation, others specify channel spacing compatibility, bandwidth, or maximum bandwidth. To clear it up: See the “FM Bandwidth Channel Spacing Deviation Table” in the article. 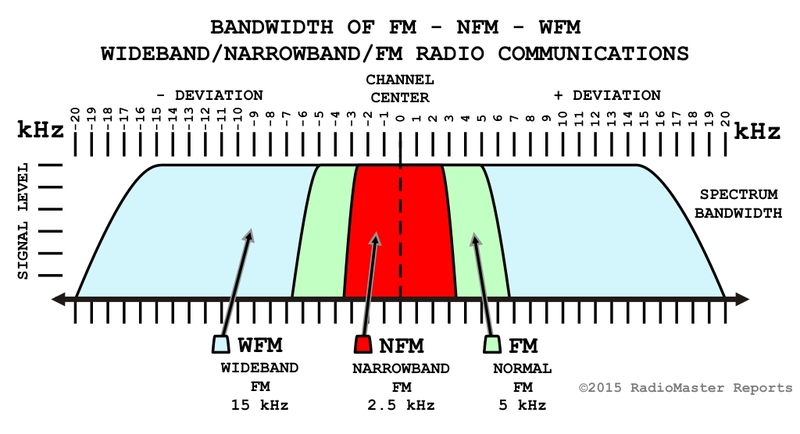 NFM 2.5 kHz Deviation is 12.5 kHz Channel Spacing and 11 kHz Bandwidth (or 11.25 kHz Maximum Authorized Bandwidth). FM 5 kHz Deviation is 25 kHz Channel Spacing and 16 kHz Bandwidth (or 20 kHz Maximum Authorized Bandwidth). The Baofeng VHF and UHF radios (like most modern HTs and mobile units) have the same Narrowband NFM capability, it is selectable in a setting of the memory channel and/or VFO menu programming. For Ham Radio, use the Normal FM setting (not NFM). For FRS use the NFM setting. For other new narrowbanded public service land mobile frequencies, use the NFM setting. Some older GMRS repeaters, and some MURS radios still use FM rather than NFM setting. I apologize if I put out bad info. I have a pair of 82’s that are not compatible with other FRS/GRMS radios and I’ve tried quite a few other manufacturers, and yes I am set to narrow band. I receive them fine but they all receive me garbled and that is for both radios. I put that out wrong because I was assured by some so called militia member that the BaoFengs work on FRS, but now that I know both are the same I am thinking he may never have tried it with another manufacturers radio. Regardless as well, the BaoFeng’s also are not able to use MURS, unless you use NB on the WB channels, it will just draw attention to you, something preppers do not want, which I believe is the biggest market of both your blog and BaoFengs. In your adulation of the militia’s you show them using MURS frequencies. If it wasn’t for the fact that the same guy in your picture is probably facing severe jail time, the FCC would probably fine him or impose jail time themselves. Especially, if it turns out that the 5’s have the same NB/WB of my 82’s, since the bands for MURS are 11.25 and 20. Bottom line is the Militias use them on MURS, because the Militias don’t care. Kind of obvious especially since you picture was taken in Oregon and as mentioned, we see how that turned out. 151.820, 151.880, and 151.940 are NB whilst 154.570 and 154.600 are WB. So while the BaoFeng’s might not be type certified, it seems like they can easily use the MURS frequencies. The Tera TR-505 is certified for both GMRS and MURS. They also are fairly reasonably priced. If you don’t mind transmitting outside the allowed bandwidth of MURS channels. The BaoFengs are 12.5 and 25. As mentioned, the MURS allowed bandwidth is 11.25 and 20. Yes, certified MURS radios will receive you, especially on the NB channels since the little bit filtered out on each side of the signal is minimal garbled audio (on NB probably unrecognizable). But as mentioned it will draw attention to you if the FCC ever starts policing those frequencies. Your signal being outside the allocation is a dead giveaway that an illegal transmitter is operating on those frequencies. You are not alone, many people fail to understand WFM/FM/NFM. Baofengs are good for NFM bandwidth for the lower 3 channels of MURS, as well as the FM bandwidth for the upper 2 channels of MURS. See the “FM Bandwidth Channel Spacing Deviation Table” table in the article to learn more. Thanks for pointing out that table. I’ve added it to my personal handbook. The garbled audio problem you’re having makes me think you might have companding enabled on one radio but not the other(s). I have Yaesu, Puxing, Dakota Alert (FCC blessed for MURS operation), and Baofeng VHF radios and can assure you there’s no garbled audio between any of them when using compatible settings for operation on the MURS freqs. You are doing everything to justify a BaoFeng on MURS and yet you say you don’t push BaoFengs. I was wrong about the 5r’s and FRS frequencies because of false information, but I am actually right on this. Channel Spacing and Bandwidth are not the same thing, but the FCC uses bandwidth to allocate channel spacing. Yes, they will work. But as mentioned MURS is NB 11.25 and WB 20 which is not what the BaoFengs transmit. So if you transmit on those frequencies using a radio with Bandwidth of 12.5NB/25WB any frequency spectrum analyzer will flag it as being an unauthorized transmitter. Another reason I suspect the Tera TR505D (I researched last night) was pushed but then pulled from their site. Thus leaving confusing information. The TR505 is GRMS/FRS. The manual will say MURS, but then researching what freq’s those actually are reveals that they are in the GRMS/FRS bands. If you want to use an illegal transmitter on MURS go ahead, that’s your call. But some people actually want to stay under the radar, so I will be getting a MURS certified radio that transmits the right bandwidth by FCC requirements. The point is on MURS. A MURS certified radio transmits a 11.25NB/20WB signal, whereas, a BaoFeng transmits 12,5NB/25WB, thus raising a red flag. The 12.5 kHz “Channel Spacing” specification of Baofengs is the same as the 11.25 kHz Maximum Authorized Bandwidth of MURS. They are exactly the same thing. They are equivalent. Identical and Interchangeable. Narrow FM (NFM) setting on Baofengs is 12.5 kHz Channel Spacing or step size, and 11.25 kHz Maximum Authorized Bandwidth. FM (FM) setting on Baofengs is 25 kHz Channel Spacing or step size, and 20 kHz Maximum Authorized Bandwidth. 1. Please actually read the article above. 2. Please observe that the article includes a section called the “FM Bandwidth Channel Spacing Deviation Table”. Read it closely. It applies to Baofeng, Yaesu, Kenwood, Icom, Motorola, Hytera, and other current brands of radios. Opinions are not the same as facts. A fact is a statement that can be proven true or false. An opinion is an expression of a person’s feelings that cannot be proven. Opinions can be based on facts or emotions and sometimes they are meant to deliberately mislead others. Expressing the same opinion, or getting a bunch of people to repeat the same opinion, doesn’t magically turn it into a fact. Therefore, it is important to be aware of an author’s purpose and choice of language. Sometimes, an author lets the facts speak for themselves. 16K0F3E means the FM transmit (Wide) is 16.0 kHz bandwidth (equivalent to the 20 kHz Maximum Authorized Bandwidth of MURS). IN MIND YOU’RE ONLY INTERESTED IN VOICE XMISSION. NBFM IS THE BETTER CHOICE FOR THAT MODE. ALSO, A “RUBBER DUCK” ANTENNA IS ONLY ABOUT 10% EFFICIENT. MAKE A PORTABLE ANTENNA TO USE. [GROUND PLANES ARE EASY]. THE NAME OF THE GAME FOR RADIO COMMS IS H.A.A.T. HEIGHT ABOVE AVERAGE TERRAIN. BEEN HAM OP. 57 YRS, NOT GOING TO BE A PREPPER. GOOD LUCK TO ALL. KF9F RICH. Happy (belated) One Year Anniversary of your last post! Throw us a bone already. I vote for something pirate/bootlegger related. First thing is to junk the boufang ht’s. They are JUNK. Buy a Wouxun uv6x.Check Powerwerx.